International Journal of Research in Health Sciences,2018,6,1,14-18. Department of Radiology, Dr. D. Y. Patil Hospital and Research centre, Nerul, Navi Mumbai, INDIA. An 11 year old male child came with complaints of pain and swelling in the left ankle region since 1 year with no previous history of trauma. Tailored X-rays of the ankle and contrast enhanced computed tomography scan of the ankle were performed on the patient in order to obtain maximum diagnostic output. 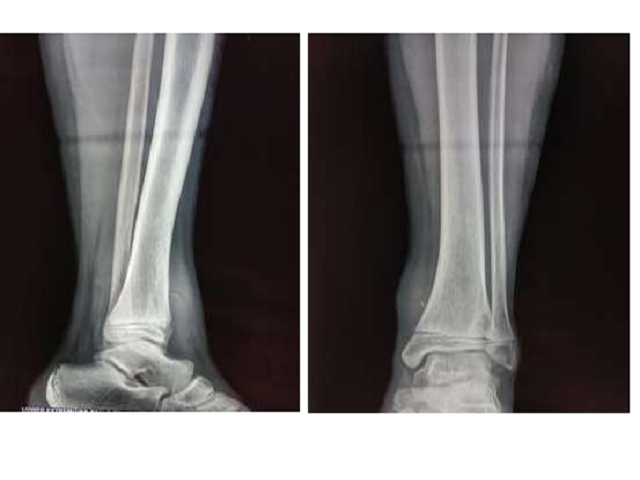 Radiological evaluation revealed well defined soft tissue lesion at the medial aspect of the distal diaphysis of the left tibia with no bony involvement. Surgical exploration revealed a foreign body with granuloma formation. It is difficult to suspect foreign body granuloma particularly in the absence of history of trauma. Even in the absence of a history of trauma, an organic foreign body lesion should be considered in the differential diagnosis of a soft tissue lesion, so as to avoid mis-diagnosis and to initiate accurate treatment. A well-defined soft tissue swelling along the medial aspect of the distal diaphysis of the left tibia with a linear well-defined radio-opacity within.